iPhone is one of the best smartphones introduced by Apple that comes up with exciting features, which makes this product different from the others. Along with these features, the iPhone enables personal hotspot, by which you can share your internet connection with the other devices. Hotspot is an incredibly convenient feature, which effectively transforms the iPhone into a wireless modem. Nevertheless, there are some factors, which can affect personal hotspot performance and make this unable to work and as a result, your laptop won’t connect to iPhone hotspot. If you are also confronting the same situation and looking for how to fix iPhone personal hotspot not working issue, then you have come to the right place. In this blog, we will focus on iPhone repair for resolving hotspot related problems. We will try to explain elaborately the generic solutions and applicable workarounds to assist you in troubleshooting this problem. Also, if you want to fix your problem without any complication, then you can consult with our expert technicians at UAE Technician. Our experts are experienced to deal with any kind of iPhone issue. So, get in touch with us and grasp effective solutions instantly. If your cellular data is not enabled in your device, that can be the main reason for your hotspot not working. By using a hotspot, you can share cellular data with others, and if you don’t switch on the cellular data connection, then you cannot share it. 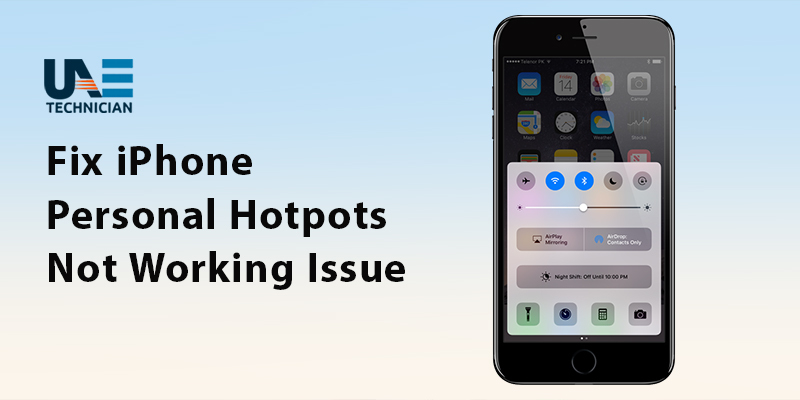 There are also other cases when iPhone personal hotspot does not work, and it happens if your personal hotspot feature is not activated on your iPhone. Sometimes, Bluetooth errors can cause the iPhone 6s hotspot not working. Also, this problem can appear, while using an incorrect wifi network, and password errors. When the number of users on a single hotspot exceeds the limit, then that can be a reason for iPhone 7 hotspot not working. Sometimes, faulty iOS updates can cause personal hotspot not working iOS 11. So, these are some of the causes, which insist you to fix iPhone personal hotspot not working issue. In this section, we will discuss some easy troubleshooting tips to fix your hotspot problem. So, go through the steps and try to perform those perfectly. Personal hotspot is completely useless without a cellular network connection or if you don’t have any proper data plan activated in your device. In order to enable your cellular data connection, go as follows. At first, go to the iPhone Settings. Then, you will find Cellular Data option. Now, enable the cellular data and try to use your hotspot. Usually, carriers automatically set the data access point in your iPhone device. But you can also set up it manually or check the APN settings by following the given pathway: Settings> Cellular> Cellular Data Network. If you find this is empty, then you can ask your carrier to send APN settings. After getting the APN settings, you will be able to access your cellular data as well as the personal hotspot. At first, navigate to the iPhone Settings. Now, select the General option. After this, you will find the Reset option; click on the Reset Network Settings and complete the reset process. If your iPhone’s personal hotspot is experiencing a software bug and unable to exchange information with the device, then try to restart your iPhone device to resolve this problem. You can hold Volume Down keys for a few seconds till you see the Apple logo boot screen. The restarting process can solve a lot of iPhone issues along with this. Apple releases several updates to fix technical glitches of iPhone, so make sure that you have the updated firmware by going to the Settings. There, you find the Software Update option, where you can check if the firmware is updated or not. Also, check if the OS of the device you are trying to connect with is updated or not. To fix the hotspot problem, at first, ensure that too many devices are not connected on your hotspot. There are some carriers who limit the number of devices that can connect to your personal hotspot once. If you have multiple devices connected, then try to reduce the number of devices. Otherwise, this can reduce your internet speed too. Hopefully, these easy steps will help you to fix iPhone personal hotspot not working issue.